Women have but one task, that of crowning the winner with garlands. The most important thing in the Olympic games is not winning but taking part—just as the most important thing in life is not the triumph but the struggle. The essential thing in life is not conquering but fighting well. The Olympic Games are for the world and all nations must be admitted to them. The Olympic Games were created for the exhaltation of the individual athlete. The Olympic Games are the quadrennial celebration of the springtime of humanity. The Olympic Movement gives the world an ideal which reckons with the reality of life, and includes a possibility to guide this reality toward the great Olympic Idea. If he is knocked out of the competition, he encourages his brothers with his words and presence. For me sport was a religion… with religious sentiment. 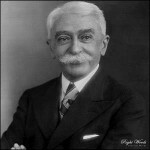 Pierre de Frédy, Baron de Coubertin was a French educator and historian, and founder of the International Olympic Committee. He is considered the father of the modern Olympic Games. Born into a French aristocratic family, he became an academic and studied a broad range of topics, most notably education and history. Pierre was the last person to the family name. In the words of his biographer John MacAloon, The last of his lineage, Pierre de Coubertin was the only member of it whose fame would outlive him. Coubertin won the gold medal for literature at the 1912 Summer Olympics for his poem Ode to Sport.